We are excited to announce that The Storm Guard has been released on . Check out the Steam Community forums to learn more about the game. For a thousand years, there has been no sign of the dragon. But while mere mortals with hasty bodies live and die, dragons spend centuries coiled in their underground lairs, sheltered from wind and weather, ignoring all the activities on the bright, green surface. Only rarely, once or twice in a thousand years, does the dragon rise. But when this happens, hell breaks loose. All the other foul creatures inhabiting the lands to the north will join the fray and invade our lands. The Storm Guard is a military order founded more than a millennium ago after the last visit of the dragon. It is dedicated to protecting the realm of men in case the dragon shall ever return. Unfortunately, after long times of peace, the Storm Guard is a shadow of what it once was. Now that the dragon is back, you, Lord Commander, must fulfil your oath. We rely on you to lead the order back to old strength. Stand strong, stay true and let nobody pass! The Storm Guard is a shadow of what it once was. After centuries of peace, castles have been abandoned and the forces reduced to a bare minimum. Our numbers have dwindled and those still serving the order lack proper training and equipment. To make matters worse, our funds are more than limited. Yet, Lord Commander, you must lead the order back to old strength. Stand strong and protect our lands from the evil forces and try to find out why they are rising again so we can stop them before it is too late. 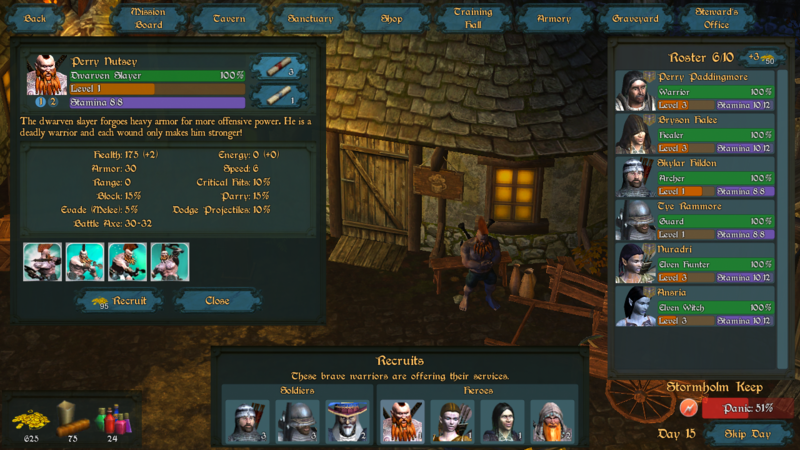 On the strategy layer, you must try to maintain a steady economy, keep panic in your lands low and manage the Order’s roster of heroes and soldiers, recruit additional members, learn new skills and get better equipment. You must decide what incidents to deal with and which ones to ignore as well as how to best use the limited resources to improve the current situation. Assemble a well-rounded group that can deal with different threats.During missions, your party will explore the area running into randomly generated events that require you to make tough decisions. 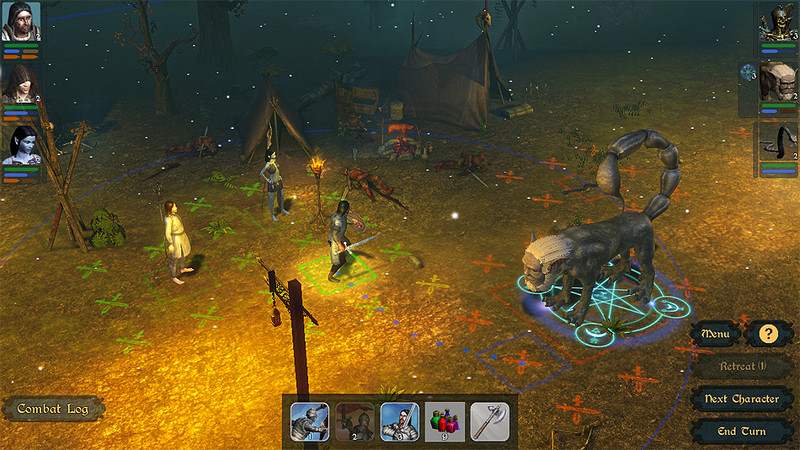 In turn-based combat, you will direct a squad of 3–5 heroes on the tactical combat field. Use good positioning and cleverly combine their abilities to prevail. All heroes have a dozen skills to specialize in and different hero combinations allow different playstyles which provides a wide range of options to explore. Decide what skills to master and develop your personal playstyle. 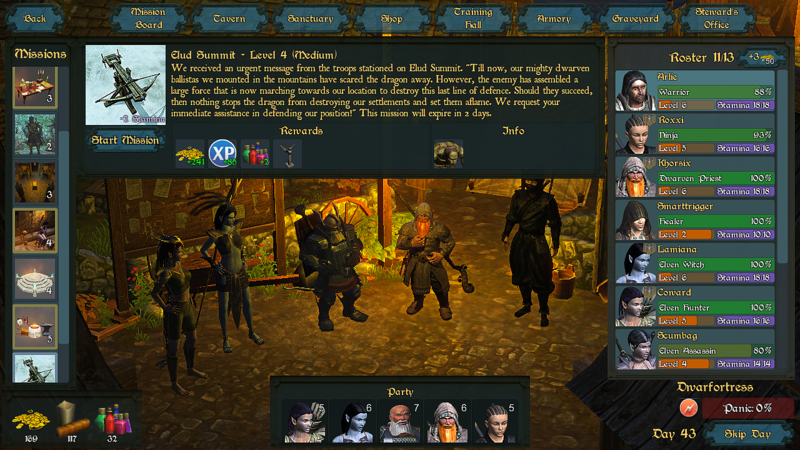 Combat includes standard mechanics like melee and ranged attacks, spells and attack skills, but also conditions (bleeding, poisoned, blind, crippled, weakened, burning), disablers (knockdown) as well as a wide range of enchantments, buffs, hexes and shouts that offer a lot of choices on both the strategic layer (how to set up my characters?) and the tactical layer (how to best use my character setup?). In combat your setup will be put to the test. The creatures you will be facing belong to three different races (orks, undead, mystic creatures). Overall, there are around 50 different monster types, ranging from small animals to huge (and powerful) flying creatures, each with their own set of abilities. Generally, the outcome is less dependent on rolling good numbers but rather on good tactical thinking, a good team and skill setup that provides synergies and can deal with different situations. Still, some encounters are more difficult than others and mistakes are often lethal. Dying is easy. Different creatures bring different skills to the table. Develop strategies to counter the enemy setup. Death is permanent in The Storm Guard. You must learn to deal with losses and take actions to mitigate risk. A wise commander knows what a particular team can accomplish and (even more importantly) what is beyond its abilities. Don’t throw away the lives of your best troops for nothing. Conversely, there are times where you must sacrifice soldiers for the greater goal. Hire new heroes and soldiers. Everybody who can hold a sword, fire a bow or cast powerful spells is more than welcome. While death is the ultimate end of a heroes life, injuries also have an impact. A hero taking damage in combat will have his constitution temporarily reduced and thus needs to rest. This means that you are advised to develop many characters in parallel to have a sufficient pool to compensate for losses and downtimes. As the game progresses, you will find out more about the reasons for these invasions and ultimately have to defeat the end-boss to beat the game. 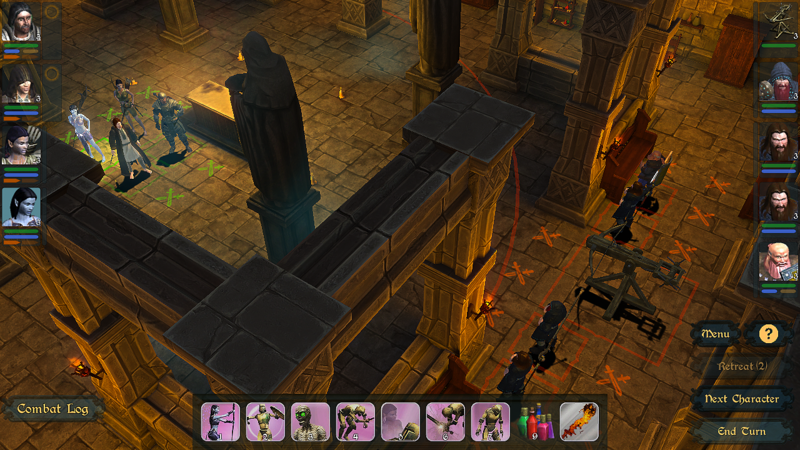 The Storm Guard is deliberately designed to be a difficult game. Bad things happen. Men will die. And when they die, they stay dead. You may run into tight financial situations and your A-Team may get wiped. There are many ways to fail on both, the strategy and the tactical combat layer. However, we tried our utmost to keep the game fair at all times. While you can have a streak of bad luck, it will never be the decisive factor for winning or losing the game. 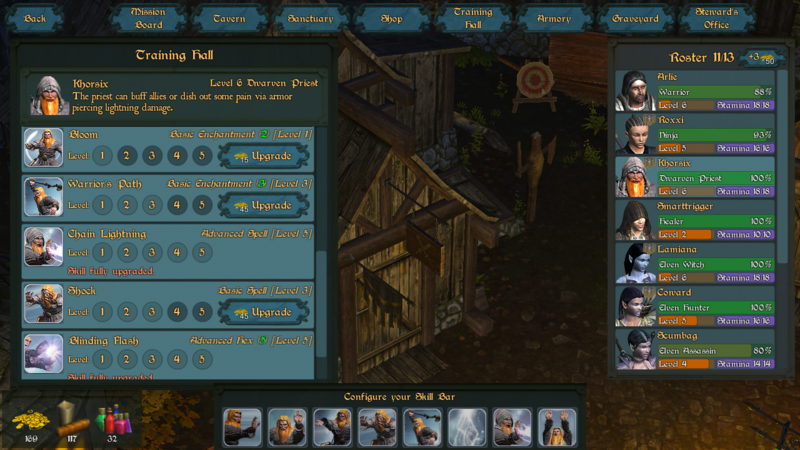 The Storm Guard is a skill-based game and it is all about making tough decisions. Will you buy better gear for your warrior? Can we afford another team member? Or shall we develop our characters’ skills (and if so, which)? What party composition do we head for? What threats shall (and can) we address with the troops at hand? While on a quest, you have to decide how much risk you want to take. Last but not least, on the tactical layer, you need to employ tactics how to best defeat the opponents, which very much depends on the enemy team composition and how your strengths compare to theirs. Ultimately, it’s you, Lord Commander, who decides who lives and who dies. Sign up to our newsletter to stay in touch! We will post updates on a regular basis and you’ll get the chance to participate in the closed beta. Visit our Developer Blog to learn more about The Storm Guard.